St. Michael's Catholic Academy | Save the Date! EDIFY Speaker Series November 14: Parent Presentation 6:30 P.M.
Save the Date! EDIFY Speaker Series November 14: Parent Presentation 6:30 P.M. In our always-on digital world, it can be hard for tweens and teens – and adults! – to successfully navigate online and IRL (In Real Life) worlds. With empathy, compassion, and humor, noted Silicon Valley author Ana Homayoun discusses some of the modern parenting dilemmas in the age of the smartphone and speaks about her latest book, “Social Media Wellness: Helping Teens and Tweens Thrive in an Unbalanced Digital World.” The book explores how the digital balancing act affects all aspects of our lives and personal wellness, and for students impacts academic abilities and social well-being, as well as emotional and physical health. 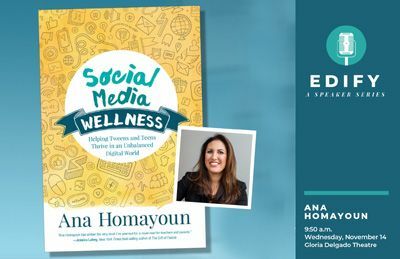 Ana’s work, which is grounded in research and based on over fifteen years of working with students of all ages, offers practical solutions for students, parents, and educators as they navigate the ever-changing issues involving social networking and healthy teen development. She will be presenting to students during the school day and offer a parent presentation in the evening. For more information, please visit: www.anahomayoun.com and www.greenivyed.com. Ana's work has been featured in the New York Times, Washington Post, Atlantic Magazine, Fast Company, USA Today, San Francisco Chronicle, San Jose Mercury News, Chicago Tribune, and ABC News, among others; she is a frequent guest on NPR.